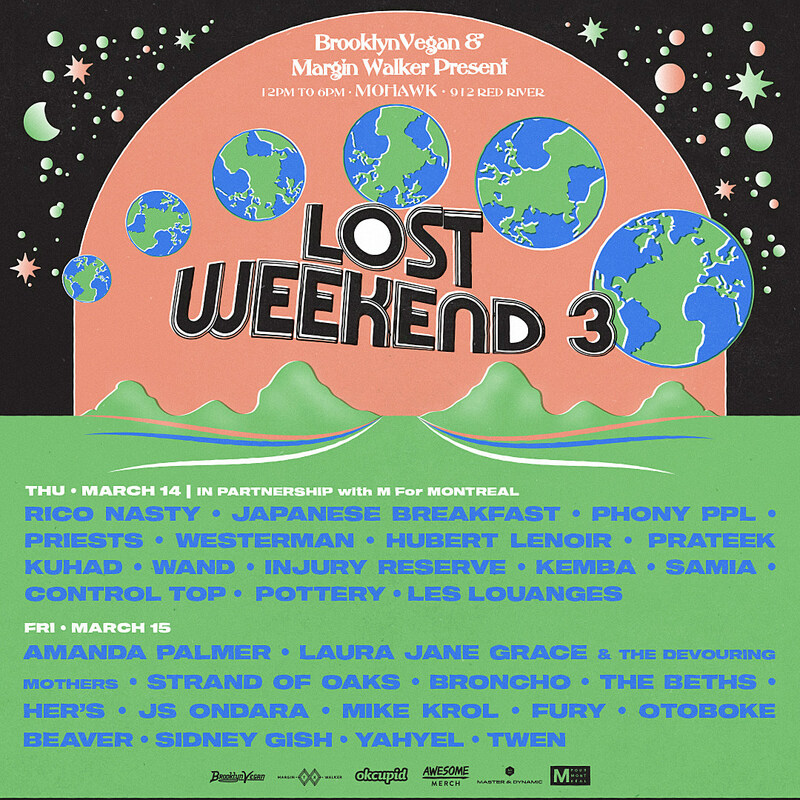 BrooklynVegan and Margin Walker’s SXSW day parties, LOST WEEKEND, are this Thursday (3/14) and Friday (3/15) from noon to 6 PM at Austin venue Mohawk (10th & Red River), and the SET TIMES for the show are now announced. UK band Her’s were also added after the initial lineup announcement. The shows are totally FREE with RSVP and if you’re not there, you can stream the sets live in VR thanks to Oculus, on SXSW’s Facebook page. RSVP now so we know you’re coming, and for a chance TO WIN a pair of Master & Dynamic MW50+ 2-In-1 Wireless On-Ear + Over-Ear Headphones (a $399 value! ), AND for a chance to win exclusive Lost Weekend merch items courtesy of our merch partner AWESOME MERCH. Make sure you’re a member of OkCupid because they’ll be inside — for the second year in a row — giving out free drinks to members with the app installed. More day party info and more info on each artist HERE. Once again, both shows are TOTALLY FREE. RSVP is open. We also have an official nighttime SXSW showcase on Saturday 3/16 at Scoot Inn with Trail of Dead, Charly Bliss, Ringo Deathstarr and more.